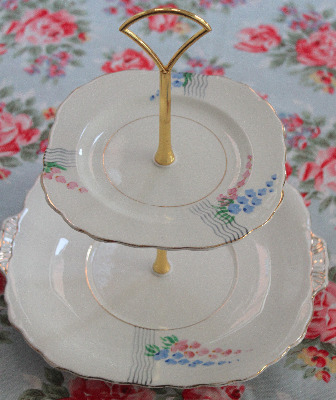 This is a prettl two tier cake stand handmade from vintage Victoria bone china plates. The background colour is white and it has simple hand painted flowers in pink and blue. This design would compliment any tea set. The plates are in excellent condition with no chips or cracks. The top plate is 15.5 cm diameter and the bottom plate is 24.5 cm diameter.